I make custom slipcovers for clients in Kalamazoo, Michigan and surrounding areas. I need your furniture to do the pin fitting (pattern work). I drape, pin and cut the fabric directly on your chair or sofa to create a custom fit. 1. Tell me about your project. Email me a description of your furniture and the type of fabric you’d like to use for your slipcover. 2. Get a price quote and yardage estimate. Once I understand the details of your project, I will cost out your slipcover and advise how much fabric to buy. 3. Purchase your fabric. You buy your yardage and have it shipped to my workroom where I do the pre-shrinking. Need some ideas? 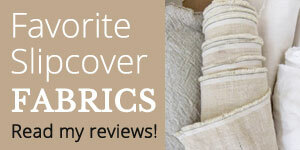 Here is a list of my favorite slipcover fabrics. 4. I pin fit and sew your slipcover. Upon receipt of your fabric, I schedule a pin-fitting to take place at your home. I drape, pin and cut the fabric directly to your furniture. Then, I remove it and take it back to my workroom where I sew it. When completed, I install your new slipcover. Labor prices below. Fabric not included. Actual cost depends on furniture design, size, number/type of cushions, skirt style and your fabric choice. Trims (other than zippers and welt cord): buttons, Velcro, skirt lining, deck fabric, etc. Cushion Refresh: Will quote. Examples — replace Dacron wrap on seat cushions, add loose fill to back cushions, order down envelopes, etc. Travel: I travel up to 1.5 hours from Kalamazoo, MI. A travel fee applies to/from clients who are located beyond 20 miles of my workroom.